Join us this year, and enjoy a day at Carmel by the sea; a most dog friendly town. Show up around 10:30 at the parking lot at the end of Ocean Ave. and we can let the hounds romp on the beach. Then at 1;15 we have reservations at the restaurant The Forge in the Forest. After lunch we can walk around town with our hounds and window shop. 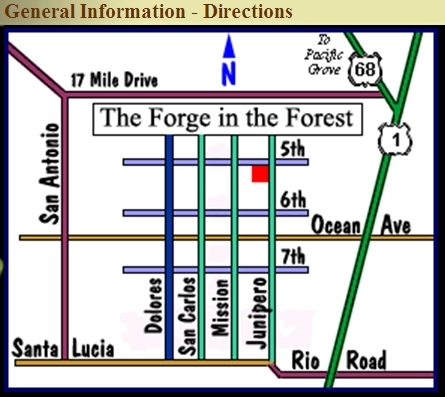 Map to Forge in the Forest restaurant. 10:30am meet at beach. look at the map below. Let our dogs romp around and enjoy the sand and serf. 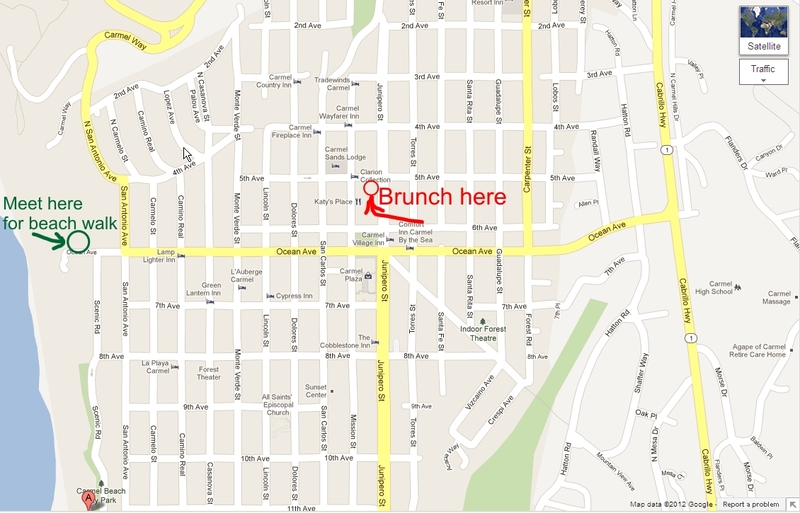 1:15pm Our brunch at The Forge in the Forest restaurant We are having a Pirate gift Exchange during brunch. Bring a wrapped gift to participate. Parking can be found around the restaurant, with a little patience. We are ordering off the regular or brunch menu. click here for restaurant menu. 3:30pm walk around town with hounds. Click on the link below for fun map of downtown Carmel. don’t forget to bring a copy; it can’t hurt. For those of you that want to plan a weekend holiday and need a place to camp with your RV, or by tent. this is the best place in the Monterey area. The Veterans Memorial park and camp ground. It is on a hill overlooking Monterey with lots of trees and lawns. It has full bathrooms with showers and water at sites. It is a first come fist use facility, with many spaces for rv’s and tents. Below is a web site with information on the campground. The price is reasonable ($27/night), with a self service pay station. Notice that there are areas to walk and enjoy around the camp area. I think this campground is one of the best kept secrets of Monterey that everyone knows about. You won’t be disappointed. Click this link for information on the Veterans Memorial park and campground. Click here for information on Veterans memorial park and campground.